Rep. Rosa DeLauro oversaw a hearing on the ACA Wednesday. Washington – Rep. Rosa DeLauro has wasted no time using her new clout to tackle something she considers an outrage – the Trump administration’s impact on the Affordable Care Act. 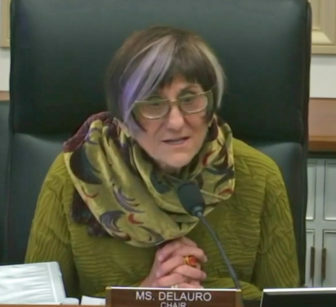 The Democratic takeover of the U.S. House has promoted DeLauro to the chairmanship of a House Appropriations subcommittee with jurisdiction over the budget of the Department of Health and Human Services. To DeLauro and most of her Democratic colleagues, the steps the Trump administration has taken to change the health care law has spurred an increase in premiums and a drop in the numbers of insured people. President Donald Trump and his Republican allies counter that the ACA has made health insurance more expensive by requiring insurers to offer a wide range of coverage and by shifting some of the cost of insuring the very sick to others. They say allowing states to offer cheaper, less comprehensive short-term plans are one way they are trying to help those who purchase individual policies, but don’t receive ACA subsidies to help pay their premiums. The top Republican on the subcommittee, Rep. Tom Cole of Oklahoma, said his state has struggled to persuade insurers to participate in its ACA marketplace. “One insurance company (in the marketplace) is not a choice. Two insurance companies are barely a choice,” Cole said. Republicans on the panel invited as their witness Ed Haislmaier, senior fellow at the Heritage Foundation, a conservative group that has pressed for the repeal of the ACA. Haislmaier said that by expanding Medicaid and requiring insurers to offer coverage to all, including the sickest Americans, the ACA has increased the price of coverage and made state marketplaces like Access Health CT unappealing to insurers. “The big brand-name insurers, the Aetnas …the Cignas, are gone (from the ACA marketplaces) and are not coming back,” Haislmaier said. Meanwhile, a defender of the ACA, Aviva Aron-Dine of the Center on Budget and Policy Priorities, said there are ways to bring premiums down, including the restoration of a reinsurance program that spreads risks among insurers, and making the ACA’s premium tax subsidies available to those who earn more than 400 percent of the federal poverty income level, which is the program’s current cap. Before she gaveled in her first hearing as a subcommittee chairman, DeLauro said her intention is to bring attention to what she says is Trump’s campaign to gut the ACA and find ways to reverse the administration’s initiatives. “One of the most critical issues that we are facing is the issue of health care,” DeLauro said. One thing that’s possible, DeLauro said, is for the Democratic-controlled Appropriations Committee to restore funding to an ACA program that pays to advertise the state marketplaces and for outreach that boosts enrollment. The Trump administration has slashed funding for the program by 90 percent and shortened enrollment periods. But there is little chance for Congress to be able to reverse other changes to the ACA, including an end to the “individual mandate,” the requirement that most Americans have health insurance or face a penalty from the Internal Revenue Service. The repeal of the individual mandate was included in a massive federal tax overhaul and was cited by a Texas judge as the basis for his decision to determine the entire ACA is now unconstitutional. That Texas decision, under appeal at the 5th U.S. Circuit Court of Appeals, will likely determine the fate of the Affordable Care Act. “I live on the brink of financial ruin,” he said. Wednesday’s debate over the ACA occurred as more Democrats are warming to the idea of replacing — or at least supplementing — the ACA with some form of a “Medicare for All” plan that would extend to others the health program that covers older Americans. Republicans, meanwhile, don’t have to the votes in Congress to repeal the ACA or even weaken it now that Democrats control the U.S. House. Republicans are also keenly aware that Americans support some parts of the ACA, including its protections for people like Morley who have pre-existing conditions, and the fact that it allows parents to keep children on their health plans until they reach the age of 26. In his State of the Union speech Tuesday night, Trump promised to protect those with pre-existing health conditions, but Democrats like DeLauro say that’s impossible to do without the ACA. As the debate over health care plays out in Congress, DeLauro will likely be a leading voice, having climbed over the years to the top of a key appropriations panel. 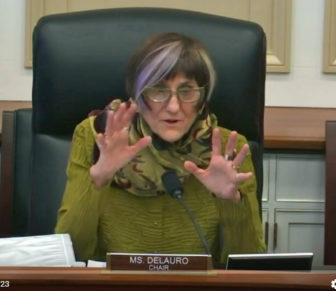 At the opening of Wednesday’s hearing, DeLauro said she tried for a seat on the Labor, Health and Human Services, Education, and Related Agencies subcommittee about a quarter of a century ago. “I wanted to serve (on the panel) because of my health condition,” said DeLauro, an ovarian cancer survivor. But former Rep. José E. Serrano, D-N.Y., was in line for that job.